Tri-Trails Park is located at the geographic crossing of three major historic trails that passed through Keith County, Nebraska during the 1800s: the Oregon Trail, Pony Express Trail and the Great Western Cattle Trail (a.k.a. the Texas Trail). * The Texas Trail, also known as the Great Western Cattle Trail, was used from 1874-1886. Over 5 million cattle and 1 million horses came up this trail, which was at least a mile wide. It originated in southern Texas and brought cattle north to the rail yards at Ogallala, earning the town the title of “Cowboy Capital”. When the herds arrived at Ogallala, they camped all around the town. Thousands of cattle grazed the hills, waiting to be loaded out by train to eastern markets. The rail yards were located on the western edge of Ogallala. Learn more about Ogallala’s Texas Trail days here. *The Oregon Trail Marker is one of many that are located all along the Oregon Trail in Nebraska. These were made in 1912 by the State of Nebraska. This marker was moved to Tri-Trails Park from a site north of here, by the Old Platte River Bridge (now gone), when Highway 61 was reconstructed. The relocated marker was set in concrete and dedicated at Tri-Trails Park in early April of 1963. The Keith County Historical Society and the Garden Club were in charge of the project. *The triangle-shaped stone displays two Pony Express Markers. This huge stone was hauled in to Tri-Trails Park by the Grapes family and Art Anderson. This monument was dedicated on June 6, 1965, at the annual spring meeting of the Nebraska State Historical Society, which was held in Ogallala that year. Mr. Anderson mounted the round (1960) Pony Express Centennial marker, which featured the three faces of the founders of “The Pony”. Unfortunately, this round marker was stolen from the rock monument in 2003. The Big Mac Kiwanis Club, who cared for Tri-Trails Park for many years, had the current replacement marker made and mounted in the stone in 2004. The rectangular Sand Hills Station marker was added to the rock and dedicated on August 22, 1967, in conjunction with the special Nebraska Centennial Pony Express Re-Ride. Both of the original Pony Express Markers were made possible by the National Pony Express Centennial Association, Dwight D. Eisenhower, Chairman. 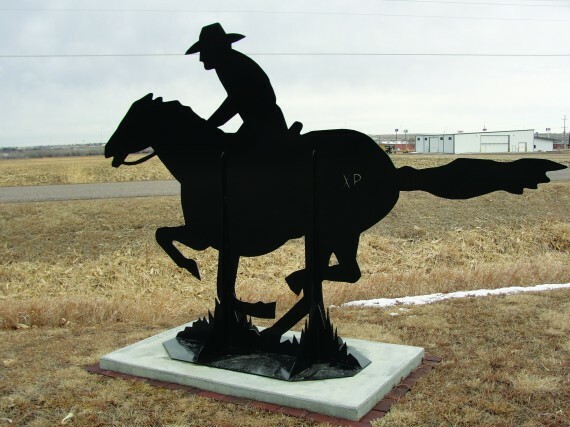 * The Pony Express Rider silhouette was dedicated on June 2, 2011. The “Pony Man”, as he is affectionately called, symbolizes the spirit of the Pony Express and captures the sense of urgency that each rider and horse displayed in getting the mail through, come what may. The Pony Man was sponsored jointly by the Nebraska Division of the National Pony Express Association, Reinke Manufacturing, and the Keith County Visitors Committee. It serves as a sentinel to greet present-day Pony Express Riders as they pass by this spot each year in June, during the almost 2000-mile Pony Express Re-Ride. This is done in 10 days, riding 24/7, just as in 1860. During the Re-Ride, Tri-Trails Park serves as a location for one of the hundreds of mochila (mailbag) exchanges from horse to horse that take place along the XP Trail between St. Joseph and Sacramento. In 2018, The Pony, traveling eastbound, will pass through Tri-Trails Park on Thursday, June 28, about mid-morning. * The Great Western Cattle Trail marker, dedicated on November 9, 2013, was donated by the Rotary Club of Ogallala. The Rotary Club of Vernon, TX, originally started placing the GWCT markers and then other Rotary Clubs along the GWCT began sponsoring the concrete post-styled markers within their areas. This marker is also dedicated to Jack Pollack, former Keith County News editor, who actively promoted the rich history of Keith County during his lifetime, as both a Rotarian and newspaper editor. * Of further historical significance, the 59 stones that are placed along the roadway and outlining the garden in the park were once part of the original 1888 Keith County Courthouse in Ogallala. Thank you to National Pony Express Association Trail Captain Mary Cone of Ogallala for her work in preserving the history of Tri-Trails Park.